When your last name is Reid, a book themed wedding is a must! As bride Katy Beth says, "I LOVE to read. Phil's last name is Reid. We also love a good play on words. When we thought of our wedding hashtag (#KBLovesToReid), I knew that I would be getting the literary themed wedding of my dreams. Katy Beth and Phil's downtown Greenville wedding incorporated their shared love of literature in a fun-filled, beautifully detailed day. The couple returned to Katy Beth's hometown to celebrate with their family and friends at two lovely spots in the trendy Upstate city. 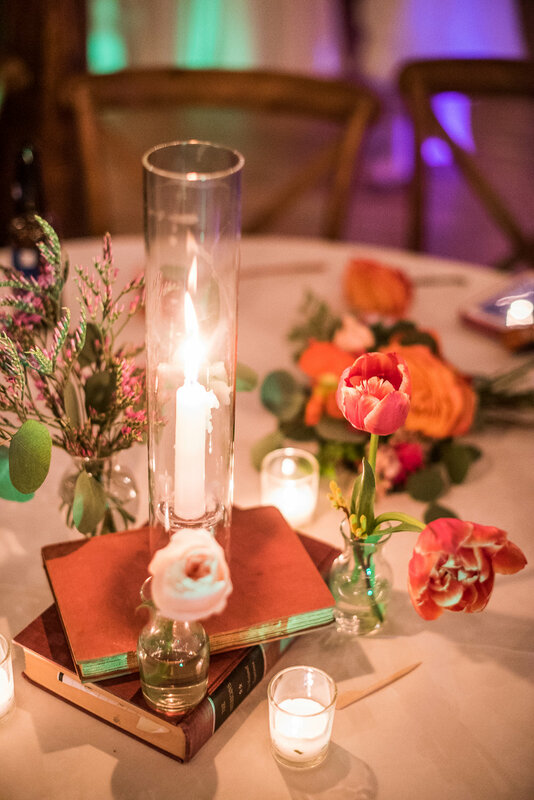 Despite the challenges of planning a South Carolina wedding from their home in Washington, D.C., Katy Beth and Phil planned and pull off a colorful, literary wedding that would charm any bibliophile. To say that Katy Beth and Phil love the theatre might be an understatement. These self-proclaimed "theatre kids" just can't resist the lure of the stage, and they love the thrill of sharing stories with audiences. When she and Phil first met, Katy Beth had just moved from Greenville to Washington, D.C. to work at Imagination Stage, a children's theatre in Bethesda, Maryland. At the theatre's Halloween party in 2011, Katy Beth was introduced to Phil, who was playing Dr. Doolittle in the theatre's current production. "I was dressed as Charlie Chaplin and Phil was dressed as an orange M&M. This was the first indication that we theatre kids would get along just fine!" recalls the bride. They bonded over their mutual interests of the theatre, books, music, and college sports, and quickly realized that their lives were better with one another. When it came time to take the next step, both were involved at every step. "We had discussed marriage for a while, and we designed my engagement ring together," remembers Katy Beth. In May 2017, Phil invited Katy Beth over to his parents' house, and her first reaction was suspicion that it would be the day she got married. But instead of doing anything extravagant, Phil asked Katy Beth to sit on the front stoop and talk. The only caveat was that Katy Beth couldn't turn around. Despite the sweet things that Phil was sharing with her, Katy Beth couldn't help but be distracted by noises behind her. Still, when Phil asked her to marry him, she was surprised--by both the proposal and the fact that all of the commotion had been made by her sisters, nieces, nephew, and brothers-in-law! Phil had arranged to have her family (who'd traveled from South Carolina) by her side as she got engaged. States the bride, "After a lot of tears, I said yes, and then got to celebrate with my family and my new family! Both Katy Beth and Phil have a love of storytelling and classic tales thanks to their shared background in theatre. That, combined with Phil's last name of Reid, led them to the conclusion that a book-themed wedding was a must! "We were thrilled that we could begin this new chapter of our love story by showcasing something we both love so much," says Katy Beth. Once they'd settled on a literary wedding experience, the two began working to translate their vision into reality. 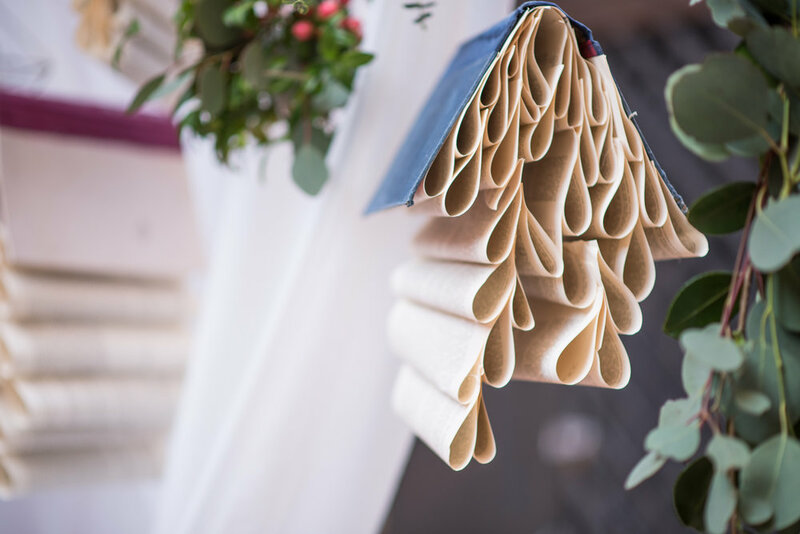 "I knew I wanted to use books in many different ways," states Katy Beth, so she enlisted the help of Corie and Tyler from Gather Upstate as well as Julie from Willow Florals to create book houses for their wedding backdrop. "[These] added color and dimension," says Katy Beth. The literary love didn't stop there. She and Phil decorated their entire wedding with books: their cake was topped with paper flowers made from book pages, stacks of books served as their table centerpieces, and the table numbers were crafted from dictionary pages. The flower girls even got a taste of the bibliophile theme, as they threw hearts cut from an upcycled dictionary instead of flowers as they came down the aisle! A wedding day is filled with emotional moments, but those moments can be even more intense when there are family members who can't be there to celebrate. Katy Beth's father passed away four years before she and Phil were married, but she wanted to make sure that her dad was there to watch his little girl get married. In the front row of the ceremony, Katy Beth and Phil left one seat open for her dad. 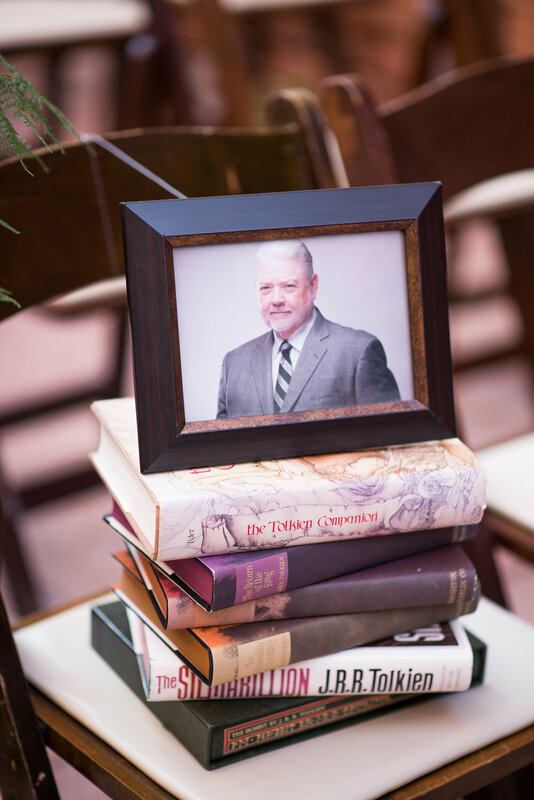 They also placed a stack of his favorite books in the chair and topped it with his photo. As an added way to make Katy Beth's dad a part of the day, designer Anna Klinger surprised Katy Beth with her dad's initials embroidered onto her custom made veil. For Katy Beth, it was crucial that she and Phil return to her hometown of Greenville to celebrate the beginning of their new lives together. "Being in the heart of downtown Greenville allowed all of our guests from out of town the chance to experience true South Carolina hospitality and beauty," she says. To create her book-themed wedding, Katy Beth called on the talents of her local friends. 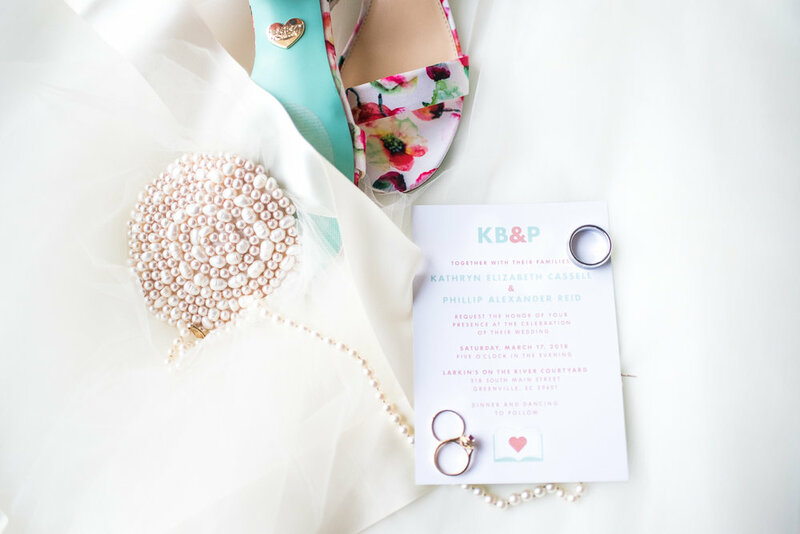 Fortuitously, one of Katy Beth's closest friends from college just happens to work at Larkin's on the River, so Katy Beth knew where to start her wedding planning. "As soon as I got engaged (and, if I'm being honest, even before I had the ring on my finger!) I connected with [my friend] Corie to learn more about Larkin's as a venue," she remembers. Katy Beth and Corie worked together to choose the proper placement for every element of the Reid wedding. "The Larkin's Courtyard was perfect for our wedding of around 110 guests, and the Shirley Roe Cabaret Room provided more than enough room for dinner and dancing," states Katy Beth of their final ceremony and reception locations. Of her big day, Katy Beth remembers, "It truly was the perfect day. It was supposed to rain the entire day, and ended up being 70 degrees and sunny with a slight breeze." She and Phil met in the courtyard of Larkin's for a modern, book-themed wedding with some sweet twists. "One of Phil's favorite parts was the way we set up the ceremony. Our musicians (the fabulous Swamp Rabbit Railroad) were on a catwalk, so our guests walked in underneath the musicians," recalls the bride. "It was a unique aspect of our big day, and truly added to the magical feel." The love and laughter that was so apparent during their ceremony continued into their light-hearted reception. The couple had a delicious spread of food waiting on their guests with a menu filled with Southern comfort food and culinary delights from the Larkin's kitchen. They kicked off the dancing with the classic "I Only Have Eyes for You," which was a touching reminder of their first date. The two had gone to the the Song 1 multimedia exhibit at the Hirshorn Museum in D.C., where the song was playing. For this couple, their Greenville wedding was the perfect start to the next chapter of their lives: gushes the bride, "All of our family and friends had an amazing time in Greenville and at Larkin's, and there isn't a single thing that I would've changed." Now, that's one perfect ending!